January 6 is National Shortbread Day in the USA. This is a good reason to cook shortbread for a dessert. National Shortbread Day is actually an ambassador for Scotland as far as the very first shortbread was cooked there. Scottish shortbread appeared in the 12th century, but its refinement is credited to Mary, Queen of Scots in the 16th century. At that time shortbread was expensive and it was served as a luxurious dessert for special occasions only. Shortbread is known for its crumbly texture that is caused by high fat amount in butter. Actually butter is added to any dough to produce a crumbly texture. Today shortbread is baked in any shape, but traditionally it was baked round and then cut into triangles. This shape represented the sun, as food historians believe. It leads to the belief that shortbread was inspired by that Pagan yule cakes, which is still a common dessert for Christmas in Europe. 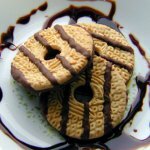 Modern shortbread is cooked in any shape, and it contains jelly, chocolate and nut toppings that make its taste better.